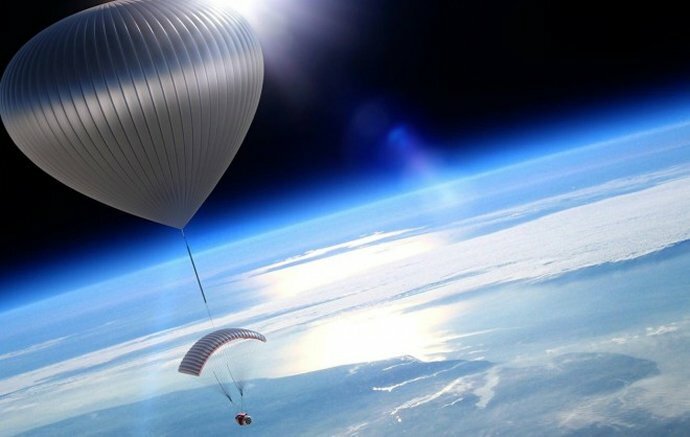 World View, the commercial balloon spaceflight company, is one step closer to launching manned voyages after successfully flying the first parafoil from the edge of space at a record-breaking height of 102,200 feet. With extremely limited air pressure and density at this high altitude, flying a parafoil is an incredible feat. This achievement signifies a major milestone for World View as this is the same altitude at which future manned flights will transition to the parafoil, which will be responsible for easing passengers gently down to Earth from the stratosphere. While World View has flown high-altitude balloons to this height before, this is the first time a parafoil has been flown at the edge of space. With this flight, World View announces a partnership with United Parachute Technologies (UPT) in conjunction with Performance Designs, which co-designed the breakthrough technology and will provide parafoil systems for both unmanned research flights and journeys to the edge of space. As the global leader in parafoil and recovery systems, UPT brings decades of experience and expertise to help World View accelerate forward and continue to make breakthroughs in technology. In the months ahead, UPT will work closely with World View’s aerodynamic systems team to design and build an advanced descent system capable of returning payloads of increasingly higher masses. This flight’s payload contained experiments from two universities. Montana State University tested a computer system designed to achieve increased reliability in extreme environments as well as a low-cost tracking and high-definition video link, which they hope to use to capture the 2017 solar eclipse on video. The University of North Florida flew experimental technology to measure the ozone gas profile in the stratosphere using a nanocrystalline gas sensor array. All three experiments are a result of student efforts over multiple years. The research and education payloads flown by World View are part of the company’s commitment to opening routine access to high-altitude balloon flights as well as its dedication to advancing STEM programs in schools. World View is pioneering a new era of discovery at the edge of space. World View offers a gentle, comfortable and life-changing travel experience to the edge of space for private citizens; and affordable access to a range of near-space commercialization opportunities for researchers, private companies and government agencies. Available today for unmanned commercial flights with an altitude threshold of 140,000 feet, and currently taking reservations for manned flights and private tours, World View is creating unprecedented access to the near-space environment. Watch the World View experience here. For more information, visit http://www.worldviewexperience.com. Follow us on Facebook and Twitter for real-time updates. For over four decades, United Parachute Technologies have designed and manufactured 60,000+ quality skydiving Harness/Container Systems for the military and sport skydivers worldwide. The company is owned by Bill Booth, who is the brilliant and innovative mind behind many of the lifesaving innovations found on every skydiving system in the world today. UPT also designed the descent system for the StratEx space dive program, in collaboration with World View, safely returning high-altitude world-record holder Alan Eustace back to Earth from 136,000 feet.